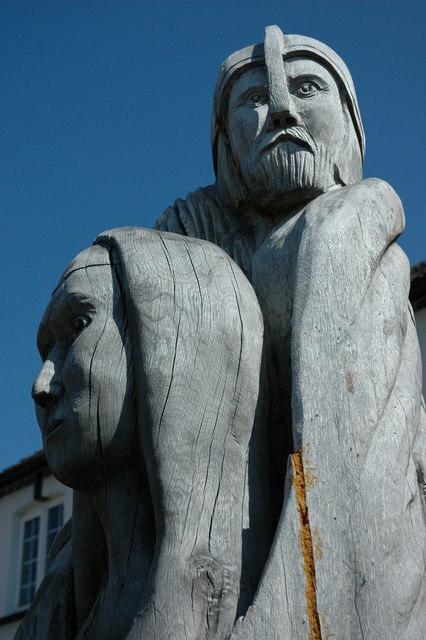 “Arthur and Guinevere” (Llangybi, UK); image courtesy of wikimedia commons. The king crouched upon the dusty floor, dreaming and not dreaming. Waiting, most of all. He’d never been good at waiting. Always, before a battle, his blood sang with impatience, his hand itching to grip his sword. This was no different, though his sword would be of little help here. He flexed his fingers, helpless, waiting. He’d ridden all night to be with her, and here he sat, useless. “I’m sorry, Your Majesty, but I can’t let you through,” the guard had said, his cheeks flushing with embarrassment. “I want to see her,” Arthur insisted. “I’ll wait.” He dismissed the guard. She didn’t want to see the king. She would have wanted to see her champion, now errant, misplaced. So in the dust Arthur sat, his ears ringing with her screams as the hours ebbed away. He drew an idle pattern in the dust, brushed it away with a finger. How easily he’d undone his work. He wiped sleeplessness from his eyes. How easily he’d undone them all. A whisper of velvet along the stone floors tugged him out of memory. He lifted his gaze as his sister descended the narrow stone stair, the small bundle swaddled in her arms. His heart rattled in his breast like a stone. Already it was over. She’d not called for him. Not once. Morgan’s blue eyes met Arthur’s. She nodded briefly, her face pale with fatigue, her mouth set in a thin line. He creaked to his feet to greet her, stepping into the shadows where she paused. They’d hardly spoken over the last several months. There had been so little to say, and so much. His throat closed around a word. “I wanted to be there,” he choked. He shrugged. “I . . . I suppose I’ll take her home. The people miss her.” He missed her, despite everything. Morgan’s eyes drifted to the child. He had quieted, slept soundly in her arms. “I hope so, Brother. Send for me, if you need me. I must go before night falls.” She pulled her hood over her dark hair, her black skirts dragging through the dust as she swept toward the door. Morgan turned, her brow arched in question. She left the king behind and strode out to the twilight forest. She mounted her steed and rode through the mist. Arthur leaned against the door frame, straining to pick her out of the distance. His eyes slipped shut. “It’s over.” He closed the door and turned toward the stair, mounting the steps two at a time.